On today, the reading is appointed about The Healing of the Woman with an issue of blood and the raising of the Daughter of Jairus. The two miracles are recounted in the same story, and although externally they may appear to be different, they really are the same miracle. By the way, we know who this woman who had an issue of blood is. Holy Tradition says that she was St. Veronica, so she is not a nameless person. As we are listening to the scriptures in the liturgy today, and the preaching of them, don’t be complacent. It is very easy to just sit down, and, shall we say, “veg” out, and take your rest for a little while. We have heard this story many, many times, maybe a hundred times, but the hundred and first time that you hear it, God will teach you something, if you are listening and praying. And even seventy times seven times, if you listen carefully with prayer, then God will teach you something. This information is vitally important and there is nothing more important that you can get during the week than what happens during the Divine Liturgy and the All Night Vigil on Saturday Night. How can it be that we can listen to something more and more, and the more that we hear it, the more important it becomes? I ask you, what are we trying to do in this life? What is our purpose? We are trying to save our souls. In anything in life we must have some sort of plan, some sort of roadmap. We must know God, in order to fulfill the commandments. God reveals Himself to us, and gives us the strength to become like Him in moral virtues, and to become perfected. This is what the Christian life is, it is self perfection. It is self perfection by the hand of God, with God’s help, but this perfection can only occur if we know what it is we must do! If we know the commandments, and more important even than knowing the commandments, we must know the One who gives the commandments. Because by knowing Him, we will know the commandments. We must know whom we serve, so that we can be like the sheep that our Lord describes in St. John’s gospel, “My sheep follow me because they know my voice”. Not intellectually, but experientially, they KNOW His voice. We need to know Him so that we will follow His commandments more easily. He said His commandments are not burdensome. There is a great mystery to that statement. All of our life seems to be filled with burdens, doesn’t it? And yet His commandments are not burdensome, and that is not a lie, because God is not made a liar. Why is this so? His commandments are not burdensome IF WE LEARN OF HIM, and we learn how sweet He is! Doesn’t it say, “Taste and see that the Lord is good”? If we, read anything in the gospels that teaches us something about know how sweet the Lord is, we will want nothing else. If we read of miracles our Lord and Savior, and we taste something of that sweetness, it should energize us to follow the commandments just a little bit more. And, God reveals Himself only to the pure. So now we have a circle. If we know God more, then we’ll follow His commandments more. And by following His commandments we will become purified and God will reveal Himself to us more. He only reveals Himself to those who are capable of understanding what He reveals and only those who will appreciate what He reveals. Any opportunity you have to learn more about your Savior you should grasp for, just like a man who is starving would grasp for a crust of bread, just like a man who is in a desert and would coming upon an oasis would bury his head in the water and would take a long, long drink. That’s how we should be when we hear the scriptures. That’s how we should when we are listening and praying in the holy liturgy or in the all night vigil, or when we are saying our prayers in the morning or in the evening or at any other time. But because of the fact that we are human beings, it’s hard to always have the same level of intensity. God knows this. That’s why we celebrate the Resurrection one day a week. We live in the reality of the Resurrection every day. But we don’t celebrate it every day of the week explicitly like we do on Sunday, because God knows that it would become commonplace to the vast majority of us poor wretches if we did that. Now some of the saints, they lived in the Resurrection every day, such as Saint Seraphim of Sarov. He would say ‘Christ is Risen’ no matter what time of the year it was. Nobody dared rebuke him, because that man was living in the Resurrection. But for the most of us, it’s not that way. So there are times appointed when we should be more intense in our spiritual life. We are coming up on one now, aren’t we? We’re coming up on the Lenten period before the Nativity of our Lord very, very soon. All the other Lenten periods are times of increased intensity in the spiritual life, but on a weekly basis, Saturday and Sunday, those are God’s days. Those are the days when God is going to teach you something. So you don’t have the luxury right now to sit down and take your ease and wait for the time that I speak and then it’s time for the rest of the Liturgy. This is not an interlude. This is part of your salvation, as much as it’s a part of mine. So while your body sits, your spirit should stand up. You should bend your ear. You should see what is it that God wants you to know. There is something He wants you know, and I don’t know what it is. And I know that I am an imperfect person; so are you. But if we pray, God will complete what is lacking, both in what I say and in what you understand. It is a marvelous mystery. So let’s look at these two miracles - really they’re the same miracle - and then let’s go forth in the strength of that knowledge, and God will help us to do His commandments a little bit more. You should know from the context, if you’ve been reading the scriptures during the week, and if you remember from last week, that this is right after He had healed the Gadarene demoniac. He had done some miracles on one side of the shore. He had healed the centurion’s servant, which is very similar to the miracle here, by the way. It contrasts with it a little bit because the centurion had much, much more faith than Jairus, about the same as the woman with an issue of blood, because God commended both of them. And then He went over to the other side of the Gadarenes, and there He met the demoniac and healed him of the legion of demons. And we saw how terrible free will can be when people choose that they don’t want to know Christ. Those people asked Christ to leave from their coast and He did, and that’s a terrible tragedy. And Jairus will get what he wishes, but will wait a while, because he did not have such firm faith, like the centurion Cornelius who said, “Only speak the word and my servant will be healed”. ‘I don’t even need you to come to my house. In fact, I am not even worthy to come to you personally. I am sending my servant because I am unworthy. But I have the faith that you will heal my servant.’ Indeed, the centurion’s servant was healed. And indeed Jairus’ daughter will be healed, but after a very long and very difficult time for this man who loves his daughter and is fearful now for her life. And there is also, we must understand, much waiting necessary on the part of Jairus, because there is this big mob, and you can’t walk quickly when there is a mob. This man who is beside himself with worry for his daughter does not have the faith of Cornelius. He has some faith, indeed, and he has confidence that the Lord will save his daughter, but at the moment he believes his daughter is alive, and he has this idea that when his daughter is dead all is lost. And then a woman comes up and spends more time, more precious time, as the clock is ticking and his daughter is dying. She had great faith. There is much to learn from this very simple miracle. This woman is not even mentioned by name in the scriptures, although we know her name. Bleeding in that day made a person unclean. A person could not go into the temple if they were bleeding. So this woman was outside of the community of faith. She couldn’t go into the temple. She couldn’t worship. She had not been in the temple for twelve long years, and she had been considered unclean for that entire period of time. She had spent all of her money on physicians, and still was incurable. She had a hopeless disease. She must have had great despondency over this disease. And this disease, this bleeding, is also indicative of our sins. Don’t we hemorrhage sins? Aren’t there things that we continually do over and over again, maybe even that we don’t even know yet, or that we won’t even admit within ourselves, even when we are alone in our closet, that we do and that are wrong with us? But we are hemorrhaging. The blood is flowing on the floor. This woman had an issue of blood. And in the same way that this woman was healed, we must be healed. She touched Christ. Not incidentally, not a shoulder of a hip touching him in the way of the crowd. But she touched his garment with faith and with belief and with hope. And she was made whole, because bleeding is a sign of lack of wholeness, a sign of sickness. But our Lord is the great Physician. The mystery of our life is how we are made whole, how we’re made complete. And God makes us complete. And we can see that in this woman. Well, this woman was discovered. She really shouldn’t have done what she did in terms of the law, because she was unclean. She was supposed to stay away from those people that were clean, just like lepers would stay away from those that were clean, and cry out, “unclean, unclean” as people went by, so that they wouldn’t touch them accidentally and be sullied, because then they’d have to go and wash themselves according to Jewish law. And she was discovered by the Lord, because the Lord knows everything. And He made a ruckus about this because he wanted to show something, to us and to Jairus. He said it to point out her faith, and He also said this to show what touching Christ really is. His disciples didn’t understand yet. They were still unformed, and were still arguing about who is the greatest. They didn’t understand yet, but, oh, they would. The leaven was good in them, and our Lord was bringing them to fruition, but they did not understand yet. What is this touching? This touching is prayer with faith. “And all things, whatsoever ye shall ask in prayer, believing, ye shall receive.”? “Ask, and it shall be given you; seek, and ye shall find; knock, and it shall be opened unto you. For every one that asketh receiveth; and he that seeketh findeth; and to him that knocketh it shall be opened.”? But you must ask in faith. You must ask without doubting, without wavering, otherwise you are like the waves tossed about in the sea like St. James talks about. Out Lord also said that virtue was gone out of Him, because he is the God-man. No Saint would say ‘virtue is gone out me’. What a blasphemous thing. You would run from the room that such a man is in, because Satan would be in that man, but our Lord and Savior was making a statement of His divinity. You see, every word in the scriptures is important. We must read them carefully, over and over again, because we a very foolish and dull people, and it takes a long time to learn everything that the Lord wants us to know, even in the scriptures, much less the Holy mysteries, and in all that he reveals to us in our hearts in that still small voice in which He talks to us. She proclaims the reason. Look at her faith. The Lord commends her for her faith. He does not commend Jairus. He heals Jairus’ daughter, but Jairus is on a lower rung than this woman. She is like Cornelius was, like the Woman of Canaan was, like Lazarus, with the sores by the gate of the rich man was. This is an example for us to imitate. This is why the Lord made this woman known to everyone. There is another reason as well, an incidental reason. She was afraid that she had “stolen” this miracle, and here conscience bothered her. Can you believe this? This is a woman who had endured 12 long years of suffering, and her conscience bothered her, that she not beseeched the Lord verbally, and asked His permission to be healed. Would that we have that kind of humility. It seems that this was a side conversation, a whispering in the ear of the ruler of the synagogue. ‘Don’t bother Him’, but our Lord heard. Imagine the heart of Jairus at the time. My daughter is dead, the light of my life, all is lost. He was hopeless, because he did not have strong faith yet. Death was final to him. It is NOT final. We know this because we are Christians. This hopelessness is similar to what the woman with the issue of blood, St. Veronica, had, but she had great faith in the midst of her hopelessness, and was healed. And Jesus heard this side conversation, someone saying ‘Don’t bother Him’, and before Jairus could even start to weep, He said: ”Fear not: believe only, and she shall be made whole.” SHE SHALL BE MADE WHOLE. And you, Jairus, shall also be made whole, because you will see what I can do. “Believe only” – that does not mean to do NOTHING except believe! That means ACT according to what you believe! This is the Christian life. In the Christian life, we don’t just believe, we act according to how we believe. Sometimes it is difficult to act this way. Sometime we have sins that we want to hold on to , and it takes effort to loosen their grip on us. Other times, terrible happen to us, and it takes great patience on our part to LIVE ACCORDING TO FAITH. And this is what is happening to Jairus now. His daughter lies dead, and the body is growing cold, and the God man says ‘Only believe”. So Jairus walks with him, and there is a germ of hope in his breast, and there is also still a terrible fear alongside. It’s all right! Perfect love casteth out fear. And when he sees what the God man will do, certainly he will grow to have perfect love, and all fear will be cast out from his heart. There is a lesson in the road that Jairus is traveling. Who knows how long it was, whether it be a hundred feet, or a thousand, whether it would have taken a minute or an hour. It must have seemed like days to Jairus, but he had to act above his circumstances. He had to accept what the Lord was saying to him, and he had to move with Him, and follow Him. We must do the same thing. We must listen when Christ says ‘Only believe’, as long as we understand that this does not mean just an intellectual assent to something. It means acting upon what our Lord has TOLD us to do, because He is the God-man. He has the right to tell us things, and He has told us many things to do, many commandments. What He was trying to do was show us humility. He was trying to keep the miracle quiet. He orchestrated every occurrence in His ministry. There was nothing that happened without His consent, and without His blessing. They tried to kill Him much, much before He was actually crucified. In the first year of His ministry, he obtained mortal enemies who tried to kill Him, and we can see in the gospels mysterious passages that say things like ‘They brought him to the brow of a hill to cast Him down, and he passed within their midst”. We don’t even know what this means! Sometimes He kept miracles quiet, other times he said to proclaim it to everyone. Such as he said to the former Gadarene demoniac: ‘proclaim to your poor brethren who have asked me to leave, proclaim who I am, and some of them may yet be saved’. He brought only his chief disciples, Peter, James and John, along with the father and mother inside a little bit into the house, and met those who were mourning the little girl. He said this so that they would proclaim that she was dead, so that no one would say. “Oh, she was only asleep”, or “this was only slight of hand’, or this was only ‘mob hysteria’. This person was really dead, and everyone who laughed at him proclaimed it, to show that this was a real miracle. And He also wanted to show that those who do not believe, and scoff at holy things are not worthy to see miracles, They are not worthy to see God act, so He cast them out of the house. In St. Marks gospel, is other important information. Although he gives this miracle privately, in front of only a few people, to show His humility, He also is the God-man! And how did He resurrect this maiden? “And he took the damsel by the hand, and said unto her, Talitha cumi; which is, being interpreted, Damsel, I say unto thee, arise”. I am the God-man. I have power over death, and I reclaim you from Hades. That is not the way that someone would heal who is just a mere mortal. He has the authority to say ‘I say to thee, arise’. Do you see how these miracles are the same? Do you understand the connection, how they were one by faith? One had greater faith than the other, and you see what happened with her? She was given what she wanted right away. Of course, she had suffered twelve years. By the way, the daughter was also twelve years old. This is interesting. The woman had suffered twelve long years of being unclean, of being ostracized. Because the Jews were not very kind to those they thought were unclean. They thought God was judging them and so they would heap abuse on such people. They did not understand mercy in the law, they only understood the black and white in the law. Our Lord came to show them the mercy that was in the law. So this woman was healed immediately, if you can say after twelve years is immediately. And Jairus was a good man and had faith. He was a ruler of a synagogue now, and so many of the synagogues did not want to have anything to do with Christ, because the Pharisees and the Sadducees were putting people out of the synagogues if they would follow Christ. Many people wanted the admiration of men, rather than to worship God. But this man was rather courageous. We have to give him his due. He was also like the man who said “Lord I believe, help Thou my unbelief” (the one who had the demoniac son). But because of his lack of faith, our Lord, shall we say, did it the hard way for him. It was a longer road. I think this is the road most of us must travel, because we don’t have that kind of faith, like the woman with an issue of blood, St. Veronica, or that Cornelius had, or that St. Photini had, or so many of the other Saints that our Lord spoke to and saw their faith, and they reacted with such love and fervor so quickly to him. We are a little bit colder, a little more hard-hearted. We look at our circumstances and they appall us too easily, and they overwhelm us too easily, even thought we have the God-man in our hearts. We don’t seem to understand that fully, so it is a little bit more difficult for us. I could speak for an hour on this, because these verses, among others in the bible, are among the most badly interpreted, and give rise to some of the worst heresies man has ever known – this idea that faith and works are not linked. There is that word again, faith. Faith is living according to Who the God-man is! We see this faith lived out in St. Veronica and Jairus. We see Christ as a healer. He heals what is infirm. He completes what is lacking. We see that this issue of blood shows uncleanness, the torrent of our sins, alienation from God, hopelessness. And death is for many, hopelessness, and it is certainly something beyond our power. What is your issue of blood? What is it that you cannot conquer? For what passion does the Devil say to you ‘Thy daughter is dead, trouble not the Master’? For what passion does that temptation come into your heart? That is what the devil says: ‘Trouble not the Master. You won’t improve. You won’t get better. You will always have problems with anger. You’ll NEVER get better. You will never stop having lust and uncleanness, you will ALWAYS be lazy, you will always have unbelief in your heart. You will always fall into this and that sin, again and again. So Trouble not the Master. Give it up. Or better yet, you may as well give yourself up to these sins, since you cannot conquer them’. Every page of the scripture says that the Devil is a LIAR, because we KNOW that we can conquer our sins. We see the God-man conquer sins on every page of the gospel, and make complete everything that is lacking in a man. Today’s epistle is classic Christological thought about the God-man, WHO HE IS, and by inference, WHY we can trust in Him and why we will be saved if we follow Him. He was talking to the Gentiles there, and we should all consider ourselves to be a Gentile. I hope that you know something of who the God-man is, and will know more and more as you continue to live. And grasp the robe of Christ with faith. And God will heal you of all your infirmities if you have faith. Amen. This homily was transcribed from one given On October 17th , 1996 according to the church calendar, (11/24 ns), being the Twenty Fourth Sunday after Pentecost, and the day appointed for the commemoration St. Ioannicius the Great and Hieromartyrs Nicander and Hermas. The Epistle reading appointed is Ephesians Eph 2:14-22, and the Gospel is Luke 8:41-56. The story recounted, that of the Healing of the Woman with an issue of blood and the raising of the Daughter of Jairus, is also given in Mark:6:22-43. There are some stylistic changes and minor corrections made and several footnotes have been added, but otherwise, it is essentially in a colloquial, “spoken” style. It is hoped that something in these words will help and edify the reader, but a sermon read from a page cannot enlighten a soul as much as attendance and reverent worship at the Vigil service, which prepares the soul for the Holy Liturgy, and the hearing of the scriptures and the preaching of them in the context of the Holy Divine Liturgy. In such circumstances the soul is enlightened much more than when words are read on a page. Cf. Matthew 18:22. This is an indication of an infinite number. This is part of the Paschal Troparion (in this context, a hymn which “sums up” the meaning of the feast, and is sung in one of eight melodies): “Christ is risen from the dead, trampling down death by death, and upon those in the tombs bestowing life”. 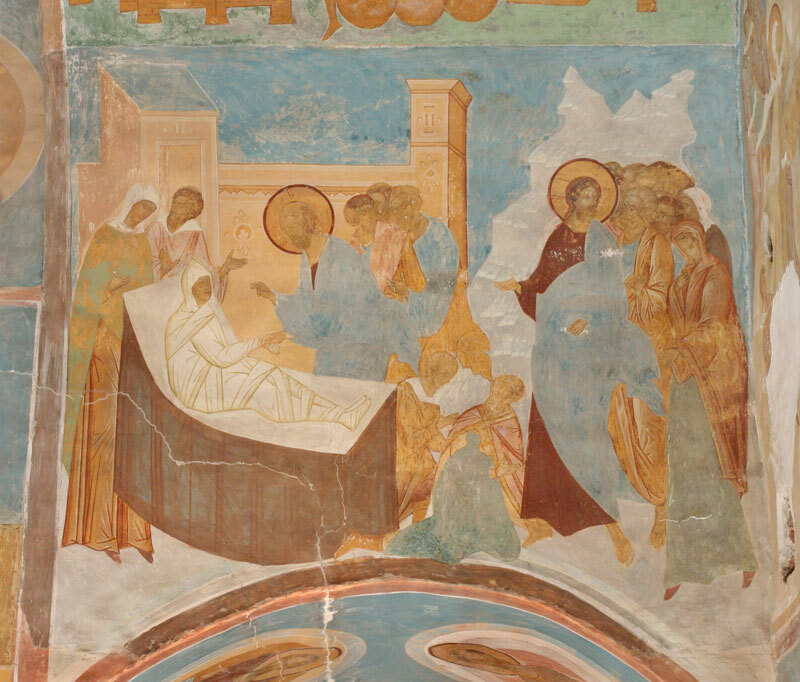 The traditional greeting Orthodox Christians give each other in the forty days following Pascha (until the Ascension) is: “Christ is risen”, to which the response it, “Truly He is risen”.